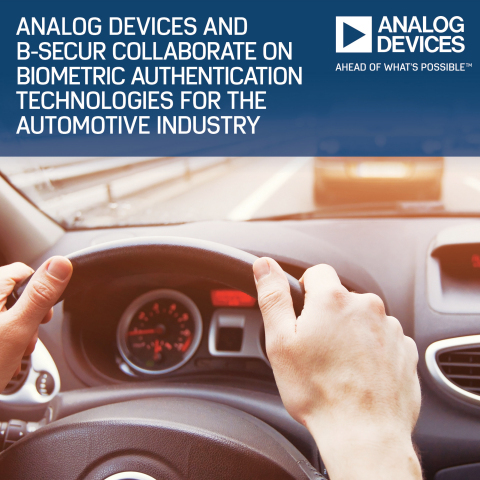 NORWOOD, Mass.--(BUSINESS WIRE)--Analog Devices, Inc. (ADI) announced today a collaboration with B-Secur LTD to develop a complete biometric authentication solution for use in automotive vehicles. The combination of ADI’s leading signal conditioning technology with B-Secur’s electrocardiogram (ECG) biometric algorithms software will enable automobiles to uniquely authenticate and identify drivers and passengers. The technology is designed to detect driver readiness and wellness by monitoring the driver’s vital signs for any irregularities. In addition, the ECG identification capability can be used to access features such as vehicle entry, immobilizer deactivation, infotainment personalization and online payments for ridesharing usage, personalized insurance payments and more.